We held our first ever “Creative Arts Showcase” evening! 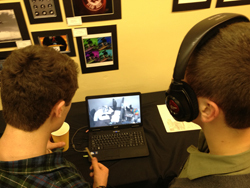 Students presented their artistic talents for their families and the Chrysalis community. It was amazing to see the vision and talent of our individual and group class students. The evening commenced with dramatic monologues presented by members of the high school theatre class. The performances were gripping, funny and touching. Audience members were also treated to hearing two of our students share their musical talents as well. After the drama portion of the evening, attendees were ushered down to the ‘gallery’ to view student artwork, photography and film pieces. 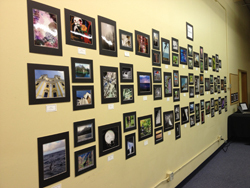 The common room was transformed into a beautiful gallery filled with a wide range of artistic pieces. All the available wall, shelf, and computer monitor space was covered with incredible artwork, design work, drawing samples, fashion designs, sculpture, and student written and produced short movies. Over 75 pieces adorned the room and every student who participated can be proud of producing such extraordinary artwork. 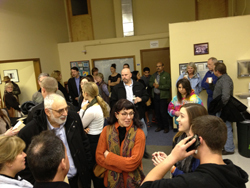 The night ended at 8pm, after having over 100 people come and share in the Chrysalis community. A huge thank you goes out to Arts Instructor, Margaret Meyer, for managing the evening and to all the teachers that helped organize and prepare and participate in the event. But the biggest ‘thank you’ goes to all the parents, family, friends and Chrysalis community members that attended the evening and made it so successful!